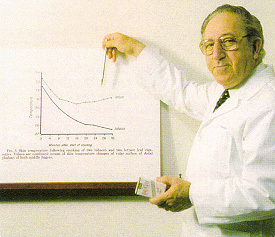 In 1959, chemist Puzant Torigian was challenged by a colleague to make a nicotine-free cigarette. He became somewhat obsessed by the idea and began systematically testing tobacco substitutes, including kale, grape, cabbage, kohlrabi, spinach, carrot, peanut, tomato leaves, and sugar beet tops. Finally, he determined that the best substitute was Lactuca sativus (or lettuce). When its leaves were properly cured, they burned like tobacco, but had no nicotine, were nonalkaloidal, nontoxic, and had lower tar and ammonia residues than tobacco. 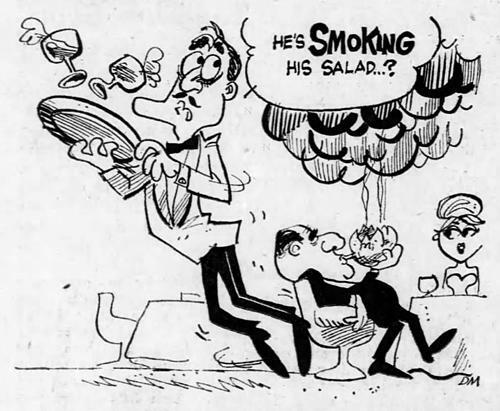 Torigian got together a group of investors in his hometown of Hereford, Texas, and in 1965 they introduced Bravo Smokes, the lettuce cigarette. Reviews of Bravo Smokes were, in general, not favorable. People said that, "It's like smoking old socks." And that they were "worse than dried buggy whip or coffee grounds in a newspaper wrapper." The company's director of marketing acknowledged that many found the cigarettes disagreeable at first, but insisted that, "If a person will smoke a carton of these he won't be able to tell the difference." Nevertheless, the company managed to find a small, niche market selling to smokers trying to quit who wanted something that would replicate the ritual of smoking but without the nicotine. 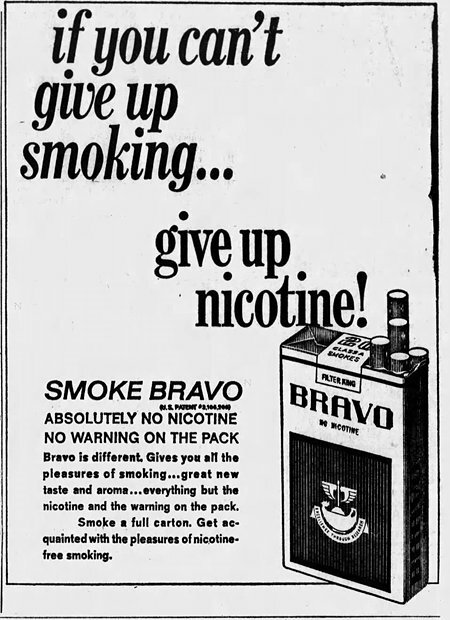 But finally, in 1972, Bravo Smokes went out of business. Torigian attributed this to a fallout among the business partners — not lack of demand for the product. 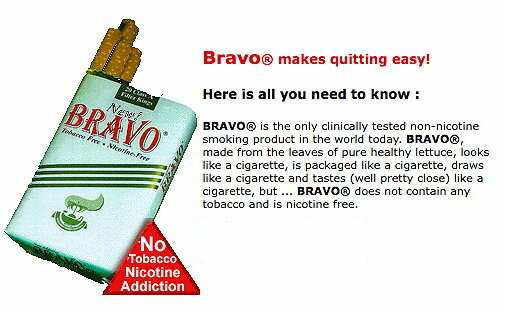 In the late 1990s, Torigian relaunched Bravo Smokes, and in its new incarnation the company seems to have lasted for at least a decade, selling a "Smoker's Survival Kit," which was 18 packs of Bravos for $92.50. So about $5.14 a pack. 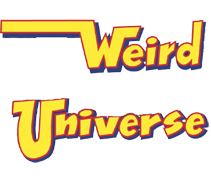 However, I'm assuming that the company must eventually have, once again, gone out of business, because I can't find any evidence that it still exists. Its website, bravosmokes.com, has now been replaced by someone's Hebrew-language blog. I think I tried one of these. At the time I was on Pall Mall non-filtered; didn't switch. I found a review of Bravo Smokes that shows they still existed (and apparently helped this guy quit) as late as 2007. Apparently there was a company selling Bravo Smokes "under license" on Ebay as last as 2009, but no more. Back when smoking was still allowed on airplanes, my wife, who was a white-knuckle flier, would light up, if only to give her something else to do with her mouth than scream in panic. We found some "herbal" smokes in France. When she lit up on the plane, she got this weird look on her face, and whispered that they smelled just like pot. Enough so that a few people were turning around to see where the stoners were. It isn't the nicotine which keeps you addicted to cigarettes, it's all the other chemicals they put in there specifically to keep you addicted to a thing which only exists to keep you addicted to it. Took me thirty years to figure that out. Sorry, it's the nicotine. The other stuff may make you crave (or not) but only the nicotine is addictive. That's why Camptext (or whatever name it's being sold under in your country) works. It breaks the receptors in the brain that nicotine has created & uses. I don't know. I've never looked. Fact: Nicotine addiction is responsible for less than 35% of all smoking. The ritual of smoking accounts for at least 52% of the addiction (which is why vaping can easily replace smoking for many individuals). "IF YOU BELIEVE FACTS, YOU WILL BELIEVE ANYTHING"! From a forgettable politicians speech.